1. Heat up oil in a large pan. Cook chopped onions, garlic, and ground spices over low heat until the onions become light golden. Add in vegetables and cook for about 5 minutes. Add water and simmer gently until the vegetables are tender, about 20 minutes. 2. Remove from heat and stir in yogurt. Serve with steamed rice. 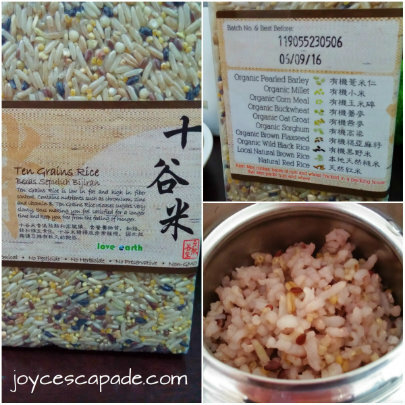 Organic Ten Grains Rice contains pearl barley, millet, corn meal, buckwheat, oat groat, sorghum, brown flaxseed, wild black rice, natural brown rice, and red rice. My boy is 22 months now, so I think it's quite alright to let him eat mixed grains per meal, 2-3 times a week. Normally, I only use millet and brown rice. Sometimes, different kinds of pasta. It's so yummy-licious that your boy enjoyed it so much ! Veggie korma?? Never eat it before. Look delicious. Nope. 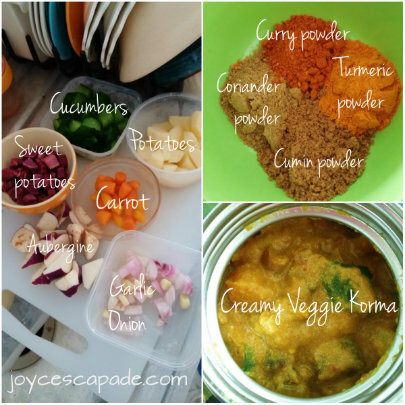 Only used 1 teaspoon of curry powder. The rest of the spices are not not spicy. But then again, my boy can eat tosai with curry at mamak stalls. He loves food with a little bit of heat. Lol.